WASHINGTON (AP) - Confident of keeping a seat, Senate Republicans are canceling $4 million in TV ads for Florida's Marco Rubio to put more money toward winning a trio of Democratic-held seats - in California, Pennsylvania and Illinois - where polls show races tightening. The moves are just the latest in a constantly shifting battleground as Republicans seek to take advantage of a political tail wind by broadening their footprint. Democrats are narrowing their focus to places they must win to keep their Senate and House majorities. With little more than two weeks before Nov. 2, both sides are making decisions hourly about where to spend limited resources even as donations continue to pour in. House Democrats, who reported raising $15.9 million in September and have $41.6 million in the bank, plan to spend at least $60 million in television ads and get-out-the-vote efforts in key House races in the final days of the election - a last-ditch attempt to salvage their hold on power. They plan to run ads in 56 to 65 races over the next two weeks. It's a 2-1 advantage over the overall spending planned by House Republicans, who had been outspending their counterparts over the past seven weeks. They raised $11.2 million and had $19 million in the bank at the end of September. But the figures are somewhat misleading because their candidates are getting an enormous amount of help from GOP-aligned groups. Next week, House Republicans or GOP-leaning outside groups plan to spend money in a whopping 82 or more competitive or could-be-close contests. And, after sitting on the sidelines for months, Democratic-allied groups are starting to pour money into competitive races to defend some of the most endangered incumbents. The American Federation of State, County and Municipal Employees reported spending $750,000 each this week to target Republican challengers to Rep. Mark Schauer in Michigan, Dina Titus in Nevada and John Boccieri in Ohio. 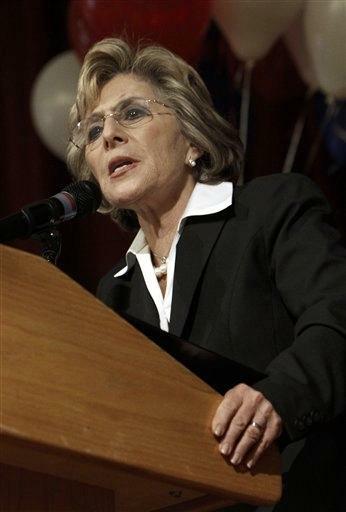 The pro-abortion rights women's group EMILY's List came to the aid of Rep. Betsy Markey, D-Colo., after Democrats scaled back their plans to help her, and spent $500,000 on ads for Rep. Betty Sutton in Ohio. The National Education Association reported spending more than $300,000 to help Rep. Larry Kissell in North Carolina, who until recently was not regarded as vulnerable. And a little-known group calling itself America's Families First, which first registered in August to raise and spend unlimited funds, reported buying TV ad time in key House races, including in Florida, Illinois and Colorado. While the House battleground expands, the Senate playing field is narrowing. Democrats have little hope now of picking up seats left open by retiring Republicans; GOP nominees lead in surveys in Ohio, New Hampshire, Missouri, Kentucky and Florida. In Florida, Rubio is so far ahead in polls that the GOP feels comfortable spending its money elsewhere, according to GOP officials familiar with the plans. They spoke on the condition of anonymity because they were not authorized to discuss strategy. The officials say Republicans are sending another $1.8 million to California - they've already committed $3 million to the race - in hopes that GOP nominee Carly Fiorina can engineer a come-from-behind triumph over Democratic Sen. Barbara Boxer. Republicans and Democrats both say private polling shows Boxer's lead from last month shrinking some. Republicans also are sinking $1.3 million more into Pennsylvania, for a total of about $3 million, after surveys showed GOP nominee Pat Toomey's advantage over Democrat Joe Sestak having shrunk. Both parties now consider the race very tight, as disillusioned Democrats have fallen in line behind Sestak in the past few weeks. Illinois, where President Barack Obama's former Senate seat is up for grabs, is proving to be among the most competitive Senate races in the country. Republicans are trying to come to GOP nominee Mark Kirk's aid in his race against Democrat Alexi Giannoulias by sending another $2 million into the state, for a total of $4 million in the homestretch. The GOP moves come as Senate Democrats all but pull out of Missouri, dramatically scaling back spending in that state, and boost spending by $2 million in Nevada to help save endangered Senate Democratic leader Harry Reid.